The Kanetsune ST-200 Fruit knife is a larger tool for larger fruit. The 4.125" blade is made from 420J2 steel, known for it's corrosion resistance and ease of sharpening. The blade shape has a slight curve to the cutting edge, prefect for processing herbs and vegetables. 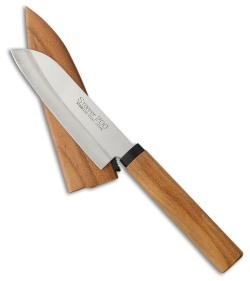 Beautiful wild cherry handle and matching sheath make this a perfect addition to any kitchen.